The Quantock Staghounds. 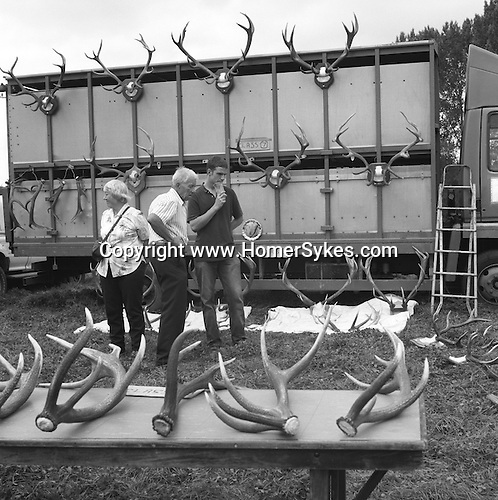 The Quantock Staghounds Antler Competition is an integral part of the August Bank Holiday Monday Quantock Show. These antlers are ones that have been found by enthusiastic antler collectors, and all have been shed naturally. Prizes are awarded for a variety of classes, ranging from Best Autumn Pair 2003 to Spring Best Single and Champion of Champions..Hunting with Hounds / Mansion Editions (isbn 0-9542233-1-4) copyright Homer Sykes. +44 (0) 20-8542-7083. < www.mansioneditions.com >.